Afraid of ticks? You should be. One of the best things you can do to control the tick population in your yard is to remove and control their habitats. Cut tall grass, trim foliage, and use a mulch barrier to prevent ticks from traveling into the yard. This won't eliminate ticks altogether, but it will help reduce their presence. Deer are a common carrier of ticks, and they can deliver them straight to your yard if you live in an area where deer are prevalent. While it may be charming to look out your window and watch deer grazing, it's in your best interest to keep them and other wildlife out if you want to control the tick population. A traditional chain-link fence won't suffice, as deer can jump quite high, so a privacy fence (at least six feet tall) is your best bet. Deer repellent also will help. Matteo Grader, pest control expert at Panther Pest Control, suggests going even further to reduce the presence of all animals. "Remove anything that attracts wildlife to your garden — bird feeders, bird baths, lodges, or anything where mice and rats can hide," he says. "Keeping birds, rats, and squirrels away is important because ticks can hitchhike on them and come into your garden." You may dread the appearance of woodland creatures like raccoons, opossums, squirrels, and groundhogs on your property, but Linda Giampa, executive director of the Bay Area Lyme Foundation in San Francisco, has a genius tip on how these rodents can help in your anti-tick crusade. You're going straight into the belly of the beast when on a woodland hike, so try to stick the middle of the trail when under a canopy of treetops and avoid brushing against shrubbery. 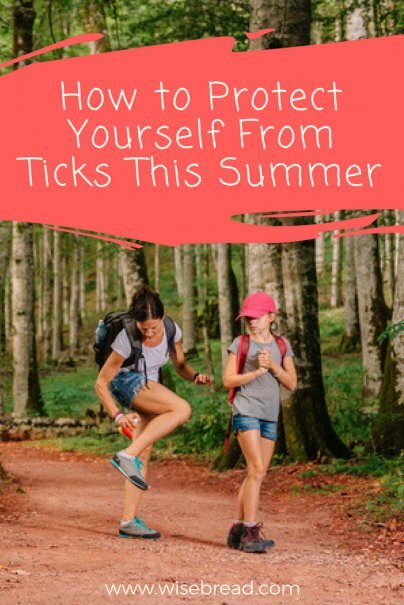 Move sandboxes, swing sets, and other play items away from any tree lines you may have to reduce the probability of ticks climbing onto your children. Put the clothing you just wore outside into the dryer for 10 minutes on high to kill any ticks that may be hiding in your shorts and shirts. It's not the heat that kills them, it's the lack of moisture, which is something they need to survive. Inspect your gear, too. Ticks may catch a ride on your camping gear, backpacks, coats, and other outdoor items. Common areas ticks like to hide on your body include your armpits, in and around your ears, inside your belly button, behind your knees, your private areas (both sides and underneath), around the waist, and especially your scalp. Then you need to repeat the allover inspection again three days after you've been in the woods. "If you've missed any ticks the first time around, and they've had a chance to feed on you, they will be bigger and easier to spot," says Giampa. It's not just wild animals that are bringing ticks to you. Your cats, dogs, and other outdoor pets that you allow back into the house are like public transportation for ticks. Your pets should take tick-prevention medication regularly, but you also should run your fingers through their coats and around their ears, necks, and limbs occasionally to be sure they're clear. Spray the aforementioned Permethrin on your clothing for protection against ticks (and other insects), and always apply a tick repellent on your skin before heading out to wooden or high-vegetation areas. Products with DEET sometimes get a bad rap — DEET is a chemical, after all — but it's the most effective repellent against ticks there is, though small children and pregnant women should apply with caution. Consult with a doctor before use if you have any other concerns.